What Happened to the Homemade Residency? As you may remember from last week, I had an epiphany about my art making and realized that I work from ideas rather than working intuitively, which brought my week of experimentation to a screeching halt. So I've been doing other things (freelance work, house work, storm preparation) while waiting for an idea to gel in my mind. I've also ordered a couple of books, and one of them arrived today. 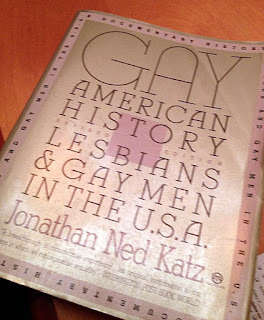 This is an older book, first published in the 1970s, that I read a long time ago and it looks like it was updated in the 1990s. I'm excited about reading it again and hopefully finding some direction for a new series of portraits. From now through November 5, 2012, use the code COLORS at checkout on Blurb Books for 20% off on two books or more. Wow, I just can't do it. I can't sit down and make a just-for-the-fun-of-it process-oriented print. It's hugely unsatisfying for me. I want to do it, really I do. I have a printmaker friend named Joyce Silverstone who makes gorgeous abstract painterly monotypes (please go look at her site) and I so envy the sheer beauty of her work. Joyce is also a Rosen Method bodyworker and to watch her work is just as beautiful as the prints she makes. She appears to be in a meditative state as she works, and you can see that she works from her body, that she works kinesthetically. I envy that, too. After my one week of homemade residency, during which I tried to explore mark making, tried to be loose and free, tried to work work kinesthetically, I've realized something that I actually already knew about myself: I work from my mind. I work from my mind. Not that my work is purely mental, not that I don't use my body (just try clearing a 36 x 40 sheet of plywood with a chisel without using your body), but my work is driven by ideas. The stimulus for any work I make is always an idea, often verbal. I care a lot about process and craft, but the process and craft are in service to the idea. If I were a painter, I would pursue the same idea with paint and if I were a sculptor I would pursue it in three dimensions. The concept, the idea, is what I care about, and my chosen medium happens to be woodblock printmaking. I knew this before, but it's suddenly clearer to me. And this seems like an important thing, to know my artistic self this way. Another thing I know is that the energy and force required to make my work come from the passion I have for the idea I'm working with -- a mind and heart combination that fires me through the process of creating the work. Any idea I work with has to have enough emotional energy behind it to carry me through the very long process required to make a print or series of prints. I formed an idea over the weekend that I think has enough *kapow* energy to work with, so my little homemade residency is taking a turn. I'm doing some research and I think I'll be starting a new print later in the week. I'll let you know what happens. For now, it's off to the library to pick up a book by Christopher Isherwood. I'd love to hear from any of you readers about how you make art, where creativity comes from for you, what motivates you. Today was a discouraging day at the residency. In retrospect I feel like I took things too far. First I added some red to the print I made yesterday. Not bad, although there was something about the simplicity of the piece before the red that was awfully nice. I kept two impressions just like this. Then I tried an experiment with the other four impressions to see if I could add intaglio linework just using a piece of wood and a baren. Not very pretty, although it is intaglio. Disappointing, but I can't learn new things without trying new things, so there you go. Today's residency is over, tonight I'll be working on some client work, and tomorrow I'll face a fresh piece of wood. Today's self-designed stay-at-home artist residency was a half day affair. I managed two layers of color (6 sheets of paper) and was delighted that several of the prints showed some nice wood grain. I'll add more details tomorrow. This image is straight out of this morning's newspaper, based on a news photo about the Exserohilum rostratum fungus that has sickened over 100 people in the current fungal meningitis outbreak. Early this morning I added a little bit of yellow to the "stones." I left two of the six prints just like this, because I liked it. Then I stopped and went to an appointment with my doctor, came back and did this to four of the prints. I think I'll call it "biology." Just a note/reminder: my intention is not to make great art here. My intention is to play and enjoy and be with whatever I'm experiencing. This is a sketch of how I felt about my visit to my doctor's office. It's been a while since I've made a woodblock print; the last one was in August, I think. With three shows currently hanging and a couple of trips to visit those galleries, life has been busy with some of the more business-type activities that make up the life of an artist. The Loaded series is complete for now, and I thought I had an idea for a new series, but now that I'm ready to actually turn my attention to starting some new work, I'm not sure what's next. So today I'm beginning a self-made artist residency that I'm offering myself in the comfort of my very own home-studio. I've purchased twenty 8" x 10" pieces of shina plywood and a few different kinds of paper and and I'm going to see what happens when I let myself make some small works based on whatever is catching my attention on a given day -- not a series, maybe not even editioned, not a Big Topic, just What Is Here Now. I'm going to try to do a print a day, although that's not a hard and fast rule. And I know already that there will be a few days when other responsibilities won't allow me to work much, but I plan to do this for two or three weeks until I find a new direction. 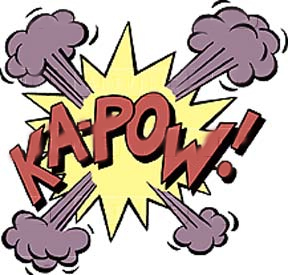 The image above is what I did today. I made six of them. Tomorrow I might go back in and do more with it, or I might just leave it as it is. I don't know, and "I don't know" is what it's all about. I love this simple and sweet little video that Beth Cullom made of the Loaded catalog. The catalog is available at Cullom Gallery if you're near Seattle, online at Blurb Books, or you can contact me if you don't like to buy online. 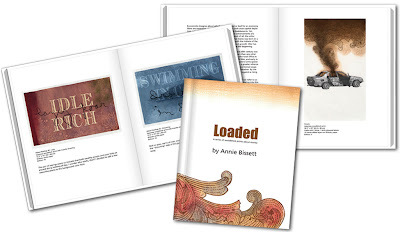 I'm happy to announce that the Loaded series is now available in book form on Blurb Books. Printed on thick paper with a slight gloss finish, this 38-page soft cover book showcases the entire group of money-based prints seen here on my web site. In addition to high-quality reproductions of the prints themselves, the book also includes writings from this blog plus text written especially for the book highlighting the back-stories that inform each print. Click here to go to the Blurb web site where you can see an online preview of the book and place an order if you like. The Amherst Biennial opened this past Saturday and the turnout was great. I spent the evening at Hope & Feathers, where my work is hanging along with work by Susan Montgomery, Liz Chalfin, Andrea Dezso, Louise Kohrman and others. 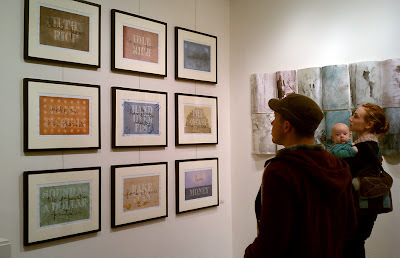 A short write-up on the Biennial web site describes the exhibit at Hope & Feathers. There are Biennial exhibits all around Amherst, at venues such as the Jones Library, the Frost Library, the Eric Carle Museum, and the Museum of Contemporary Art at UMass. You can find an online map of all the venues here on the Amherst town web site, so if you're planning to come to the Pioneer Valley for some leaf peeping, download the map and stop in for some art viewing as well. The Biennial runs through November 30, 2012.
Review of "Not the Usual Politics"
Checking my email on Sunday morning, I was thrilled to hear from a friend in Maine that the Portland Press Herald contained a review by art historian Daniel Kany of the “Not the Usual Politics” show at Rose Contemporary in Portland. Kany examined two of my works in the show, “God Blesses John Alexander and Thomas Roberts” (or as I like to call that print, “The Gay Pilgrims”) and “Pyramid” (from the Loaded series). I'll be joining artists Adriane Herman and Dan Mills in Portland at Rose Contemporary for an artists’ talk on Saturday, October 13, from 2:00-4:00 pm.